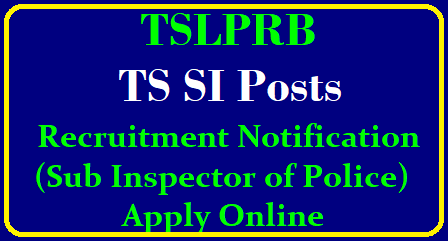 Name of the Recruitment Board or Authority : Telangana State Level Police Recruitment Board (TSLPRB). Mode of Application : Apply Online. Name of the Designation : Sub Inspector & ASI Posts. Number of Vacancies : 1272 Jobs. Release Date of Advertiseme: 31st May 2018. Starting Date to fill Online Application Form : 9th June 2018. Final Date to Apply Onlin: 30th June 2018. Dear Candidates, Are you looking for TS Police Notifications to grab an excellent opportunity for your career? Then, check the information provided below which explains you about TS Police Jobs. In addition to this, Telangana Police Notification 2018 was issued on 31st May 2018 with an advertisement no. 89 / Rect. / Admn-1 / 2018 and 91 / Rect. / Admn-1 / 2018. Hence, TS Police Recruitment Board equipped with 1272 Sub Inspector & ASI Jobs. Therefore, aspirants can check the eligibility details of Police Recruitment 2018 Telangana which includes age limit and required educational qualifications. However, you can also access the various sections offered in this article about Telangana State Police Recruitment 2018. Furthermore, interested and candidates those who are eligible can start applying for TSLPRB SI Recruitment 2018 from 9th June 2018. As a result, applicants can fill and submit Telangana Police SI Recruitment 2018 Online Application Form on or before 30th June 2018. In conclusion, TS Police Recruitment 2018 Apply Online @ tslprb.in as soon as possible to avoid server issues. TSLPRB offered a great opportunity of 1272 TS Police SI and ASI Jobs. Therefore, contenders should check the eligibility details which consists of educational qualifications and the desired age limit mentioned below. Aspirants should have completed Intermediate or any equivalent qualification and must hold a degree from any University of India. Lower Age Limit – 21 Years. Furthermore, the various positions in Telangana Police SI Recruitment 2018 equipped with different maximum age requirements. Hence, you can go through the details mentioned in Telangana Police Notification 2018-19. Furthermore, you can also go through Telangana Police Recruitment procedure mentioned below, and also TS Police SI Salary details. This allows you to gain detailed information and interested candidates apply online @ tslprb.in before the last date. Candidates are suggested to check the official notification for details regarding monthly payment. However, the officials of TS Police Recruitment Board offers pay scale as per their norms and conditions. How to Apply for TS Police Recruitment 2018? Follow the process of filling Telangana Police SI Recruitment 2018 Online Application Form mentioned below. Go to the official website of Telangana State Level Police Recruitment Board (TSLPRB) i.e. tslprb.in and search for TS Police Notification 2018. Now, read the rules and regulations which also includes eligibility criteria mentioned in Telangana Police SI Recruitment 2018 Notification. If you have fulfilled the eligibility conditions, then click on TSLPRB Recruitment 2018 Apply Online link. Enter the required details in Telangana Police SI Recruitment 2018 Online Application Form correctly. Later, Upload scanned documents, photo, and signature in Telangana State Police Recruitment 2018 Online Form. Furthermore, make a payment of the application fees as prescribed in TSLPRB SI Notification 2018. Re-verify the filled details in Online Application Form of TSLPRB SI Notification 2018 and click on Submit button. In conclusion, take a print out the filled application form and keep it safe for further reference. The information explained in this article regarding Telangana Police SI Recruitment 2018 is just an overall info. Hence, interested competitors can go through TSLPRB SI Notification 2018 in case of arrival of any queries or doubts. In addition to this, you can download the same i.e. Telangana Police Notification 2018 from below link or from TSLPRB Official Website.